DSi to challenge Apple&apos;s app store with downloadable content? As if the news of a new DS wasn’t exciting enough, it would appear downloadable games aren’t the only thing Nintendo has in store for the flash drive of its new and improved handheld. Nintendo’s vision stretches beyond mere gaming and is hoping to steal a substantial amount Apple’s thunder by offering its loyal customers downloadable apps akin to what is on offer in Apple’s app store. At the moment, the DSi store has only one third party application – the Mojipittan Shiritori Clock, which luckily is only available in Japan, giving the big N plenty of time to bring the UK a wealth of other applications that’ll muster more than just an effortless “meh”. 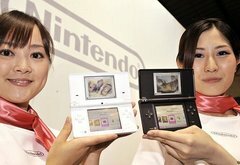 Nintendo want developers to really get those thinking caps on and produce applications that are not only creative but make full use of the DSi’s newly added functionality as a portable media device. Rumours have surfaced that a Facebook application is on the horizon (surprise surprise), allowing users to upload photos and video taken using their handheld’s double whammy of cameras. Word on the web is Nintendo will be revealing all ahead of the US and UK’s April launch date, which considering is only around the corner means we should be hearing more on its ostensible DSiWare store very soon.